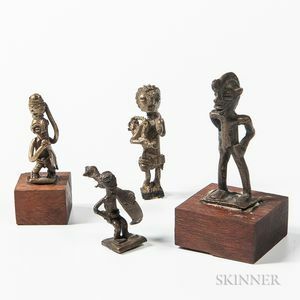 Four Figurative Akan Goldweights, an herbalist carrying a shrine, ht. 1 3/4; a warrior carrying guns, ht. 2 1/4; a man carrying a sword, ht. 1 3/8; and a standing figure, ht. 1 3/4 in. Provenance: Newman Collection, New Jersey; standing figure from Parke Bernet Galleries, New York, May 23, 1973, Lot 165. Exhibitions: Asante Goldweights, Montclair Art Museum, Montclair, New Jersey, February-April 1988.